March 1993, he was elected as Henan Provincial Political Consultative Committee and appointed as Director of Buddhist Association of China that October.1997 he was re-appointed as the director of Shaolin Temple Management Committee and presided over Shaolin Temple.March 1998, he was elected as representative of the Ninth National People’s Congress and Chairman of the Henan Province Buddhist Association that July. August 1999, he was inaugurated as Shaolin Abbot in the Inaugural Ceremony. 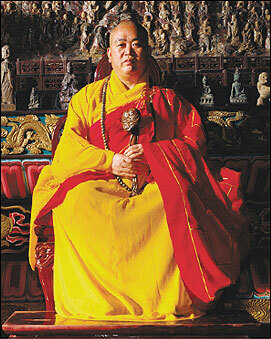 September 2002, he was elected as Vice Chairman of the Buddhist Association of China. March 2003 and 2008, he was respectively elected as representative of the Tenth National People’s Congress and representative of the Eleventh National People’s Congress.February 2010, Ven. Yongxin was elected as Director of Overseas Communication Committee of Buddhist Association of China. Ven. Abbot Yongxin has been tirelessly protecting and reviving the tangible and intangible heritage of Shaolin Temple. He has done a great deal of work for Shaolin from renovating the ancient architectures to compiling and classifying classic books of Shaolin Temple, such as The Secret Book of Shaolin Kung Fu and Medicine, Shaolin Kungfu and Works of Shaolin Kungfu, Chan Dew Collections, Selected Papers on Shaolin Study, Shaolin in My Heart, etc.